(METALCO) is located in Doha/Qatar C ring rood st 882 area 26. METALCO SUPPLY & INSTALLATION wide range of steel doors for interior and exterior use. METALCO is the most reliable metal architectural products manufacturer, by using only highest quality materials and manufacturing techniques. METALCO doors are produced in many sizes, gauges and design to meet the needs of customers. 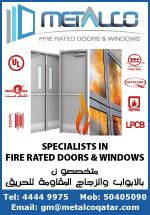 We have produced thousands of doors and frames to different prestigious projects in UAE, nearby GCC and African countries for different building applications .To become more competitive in the market , METALCO starts to widen the scope of manufacturing, from steel doors to manufacturing of 30 min to 120 min Fire Rating and Non- Fire Rating Timber Doors, cabinetry and wall paneling. QMI steel and wood factory has the advance machineries, technology and skilled manpower to meet the highest quality of craftsmanship expected by clients. METALCO prides itself of having a most competent team who works hand in hand to produce a high end quality designs f or export cabinetry an d door made of steel and wood. · Both our steel and wooden doors conform to British Standards. · METALCO is an EN ISO 9001 and 2008 certified company. · Our fire rated steel door XOVA WARRINGTON BS Standards – UK (476 Part Our Fire Rated Steel 22) and Timber Doors is certified by BM TRADA. · Our factory is equipped with state of the art computerized machines using the latest technology available in the market for fabrication of our products. · Our commitment to supply quality Steel and Timber Doors, Cabinetry and wall panels while providing the best services to our clients us our top most priority.